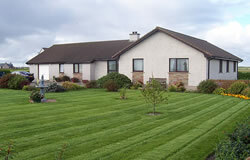 Borve Guest House is a small, family-run establishment on the island of Benbecula. The owners, Calum and Gretta Campbell, together with their son Colin, pride themselves in receiving a 4 star grading from Visit Scotland. They have been running the guest house for 15 years and have built a reputation for providing quality accommodation at affordable prices. The family are Gaelic speakers and are native to the island. The guest house provides an excellent base for exploring the beautiful beaches, lochs and moorland that characterise the island, and seeing all the wildlife they attract. It is conveniently located for Benbecula airport (3 miles), a range of local attractions and places to eat. The remains of Borve Castle are on the doorstep.